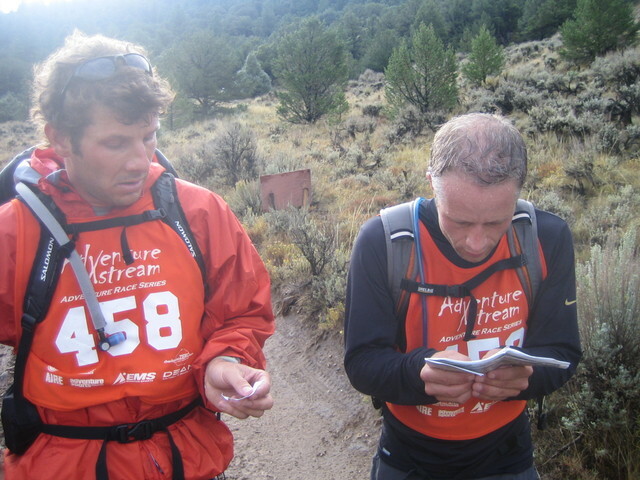 2006 Adventure Extreme Vail Race | No Soap, Radio! Unfortunately, I have been a little deliquent in keeping up with some recent posts so I am now going to play catch up! Our "Team All Over The Map" (myself, Nick Wilder, John Preston, and Durdam) managed to take first in the 4-person open category. The nearly 9 hour effort had some baby epic elements to it! After an initial mountain bike ride we took to the red Colorado river for an exciting paddle. The next trek phase went really really well as we scrambled about nabbing check points. It was the subsequent bike leg that turned into a gruelling uphill slog for more than 10 miles. The scenery was beautiful but the entire team was spent upon reaching the turn around. While checking in there, we heard an explosion which I interpreted as "OMG, we are under mortar attack!" It was, in fact, a lightening bolt and thunder clap just yards away. And so what should have been a glorious descent turned ugly as first sleet and then a cold rain pounded us. We still had many miles to go to return to our transition area and absent proper clothes it was a serious shiver fest. The rain and cold did help reduce the anxiety of the lightening strikes on the ridge! You might imagine that we weren’t overjoyed at the prospect of changing back into river gear (oh no!) for the final let, a paddle. Fortunately the sun was out on the river and it wasn’t terrible, but we were all pretty tired and looking forward to packing up our piles of sloppy gear and clothes and getting back to the hotel.